More Prima projects and blog candy! And happy Friday! 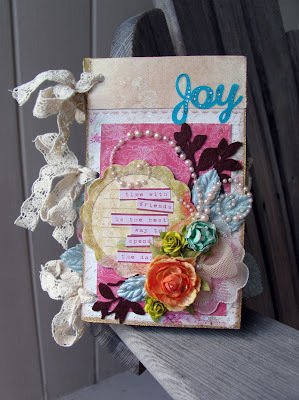 I have class lined up for tonight on Live with Prima and another project from CHA to share too. And then I hope to get more projects finished for next week. This post is kind of wordy-sorry for that! Live with Prima on the Road!! This is my Joy Mini Album I am going to create tonight for my class. 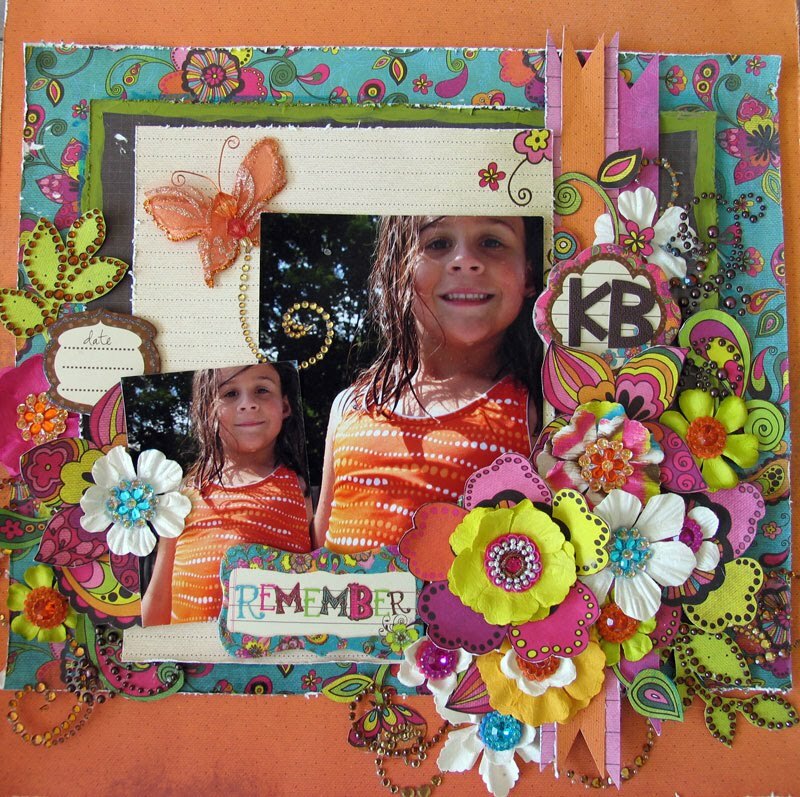 I am teaching this class for Prima at my local scrapbook store called Stampin & Scrappin Time in Bridgeport NY. It's just 15 minutes outside of Syracuse. I will have a classroom full of attendees and it will be aired "live" at the same time for anyone around the world to tune in and watch from home. Here is the store from where i will be teaching! It's really quaint and artsy-and everyone there is soooo helpful and friendly! Everyone is welcome to join in on the chat! Create a free account on ustream and then log in. 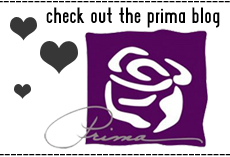 Search "prima flowers" and click on the Prima logo to see the class and chat box. You can tune in anytime you want and if you can't make it for the show-we record all of them so you can watch it at your leisure. I will create this project from start to finish. There will be some clever ideas incorporated into each page and fun techniques too! This is a mini album made from Prima packaging. Prima has an amazing Go Green Concept program where all of our packaging can be re-used for all kinds of projects. 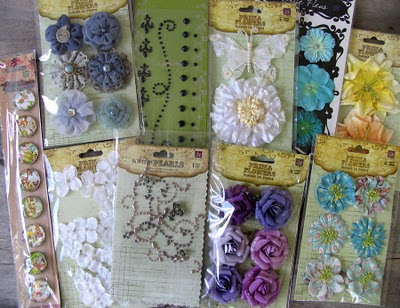 It's like getting free product when you purchase our flowers or embellishments. Brand new CHA Summer 2010 products are in this kit, so you can be one of the first to have these new goodies in your hands! How cool is that? I hope you can join me and chat with us during the class! We are going to have so much fun! And I have another layout to share with you! This layout of Kate is one of my faves to date. She is such a sweetie! I used Prima's brand new Paisley Road paper line from CHA. I mixed in a bunch of goodies such as, chipboard embellishments, Coordinating flowers, page pebbles, pearl swirls and a cute butterfly. This layout has tons of layering added. I cut out flowers and shapes, then attached them with foam tape for the dimension. 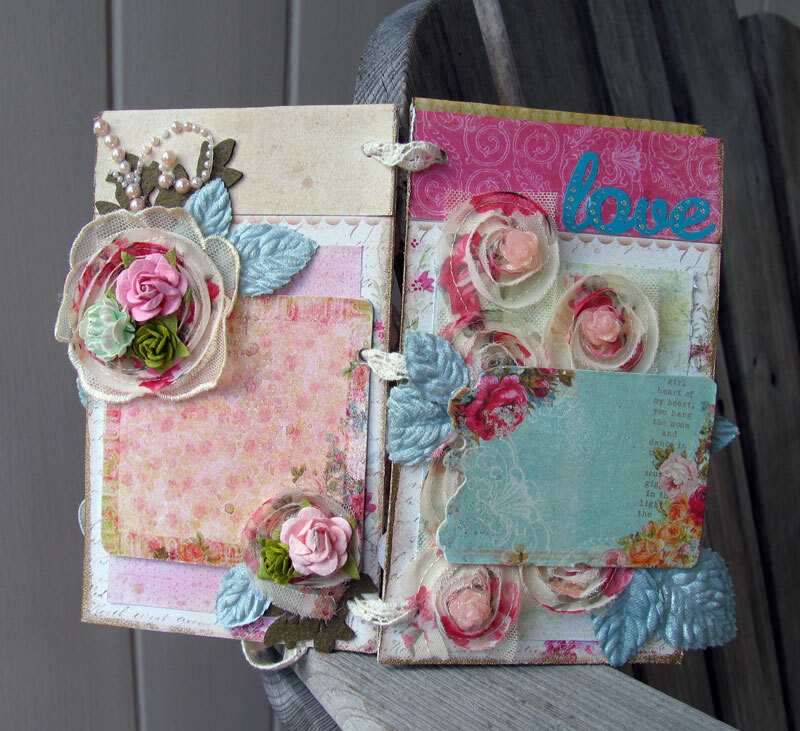 All of the paper edges are distressed and I added some dynasty centers here and there to the flower centers. Here's a close up of some of the details. Paper cut outs mixed in with flowers, pearls and chipboard. I will be back after the weekend with more news and goodies to share! And I hope you can make it to my class! I would love to see everyone there! I hope everyone is having a nice relaxing weekend! I unfortunately, have been cleaning and organizing! My family room in the basement was a disaster and it was long over due. It took me almost the entire day to work on it. Today will be the same, more cleaning. But it feels good to get it done. The winner is Fryne!!! Congrats! E-mail me with your address so I can send out your goodies! And -I wanted to share more projects with you. 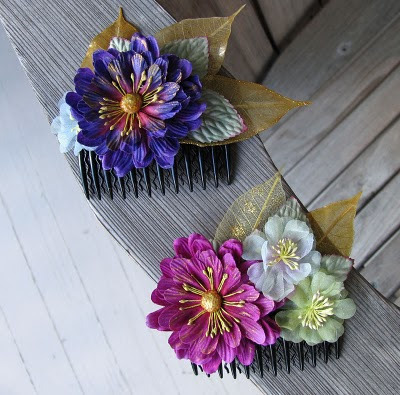 These are some hair combs I decorated with new Prima flowers called Autumn Harvest. I just love the purples and blues mixed together. I mixed in some blue mulberry leaves and gold temple leaves too. Fabri Tac worked really well to hold everything together. Unfortunately, one of these lovelies dissappeared at the show. (insert sad face here) But I can always make more and someone must of really really wanted it. And the funny thing is-if they had asked, I probably would have given it to them anyway. The possibilities are endless for a project like this. 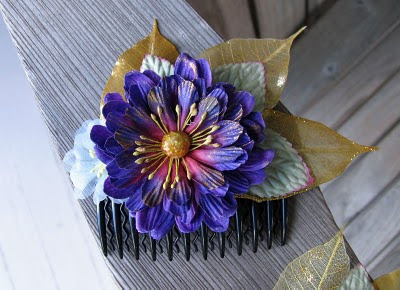 You could mix and match all kinds of flowers for any occasion. Thanks for stopping by-I'll be back soon with more news and projects! 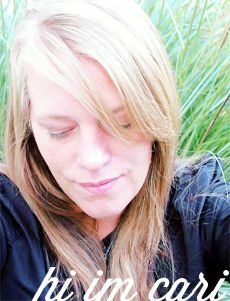 I feel rested from CHA-it was crazy hard work-and I am trying to get through my list of post CHA stuff that needs to get done. 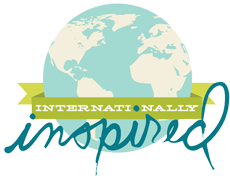 And I am preparing to venture out to Chicago again for the Scrapbook Expo in St. Charles, August 20th and 21st. 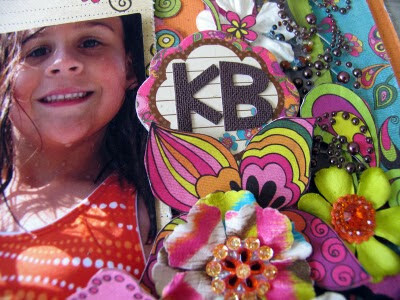 Prima has a booth at the expo and we are doing free make and takes there! Rebecca is venturing out with me. If anyone plans to go, please stop by to see me! And here is a layout I made for CHA using the new Jack and Jill line by Prima. I took these photos from Christine Middlecamp's blog-I haven't taken my own photos yet. She takes amazing photos too. 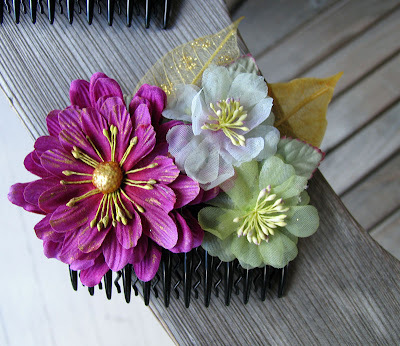 I also used some SIIC swirls with lace-they are dreamy! A Carnation branch, new alphabet letters, Sweet Taffy flowers and matching chipboard accents were also used. Thanks so much for stopping by! I'll be back with a winner and more projects.